In 1-quart heavy saucepan, heat 1 1/2 cups of the broth, the bouillon granules and pepper over medium heat, stirring constantly, until bouillon granules are dissolved. In small bowl, stir remaining 1/2 cup broth and the flour, using wire whisk, until smooth. Gradually stir flour mixture into broth in saucepan. Heat to boiling. Cook, stirring constantly, until thickened and bubbly. Stir in a few drops of browning sauce if a darker color is desired. For a creamy gravy, substitute 1 cup milk, half-and-half, whipping cream or evaporated milk for 1 cup of the broth. 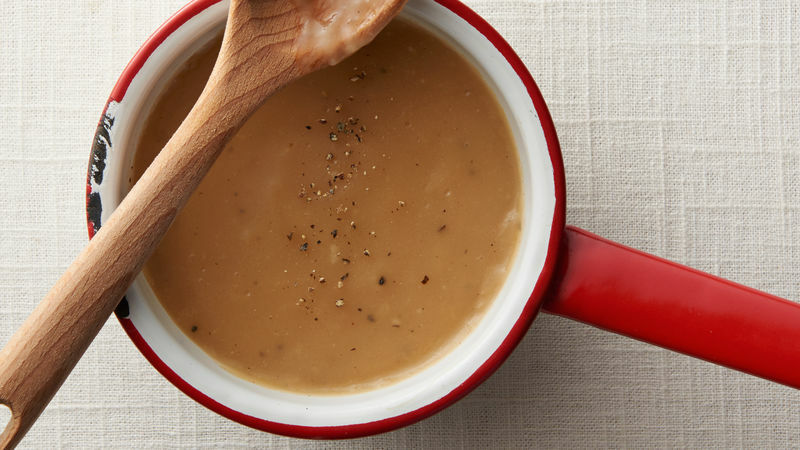 You can make homemade gravy without the hassle of roasting a turkey, thanks to this easy gravy recipe from Betty Crocker. All you need is some chicken broth, chicken bouillon granules, pepper and a little flour — maybe some browning sauce, if you’ve got it on hand. With these four ingredients, you’ll have silky, savory gravy for your mashed potatoes in 15 minutes. Not quite the gravy recipe you were looking for? Don’t worry, Betty’s got gravy recipes galore, plus step-by-step instructions on how to make gravy.